Finally the iPad is here. The transition can begin. What you previously have done on your Mac alone is now probably split between two devices. You will want to start a task on one device and continue on the other. But how do our documents, links and emails come with us as we move between devices? That’s what we thought when we updated Searchlight to work on the iPad. We wanted an easy way to access our files, links and emails that are stored on the Mac. 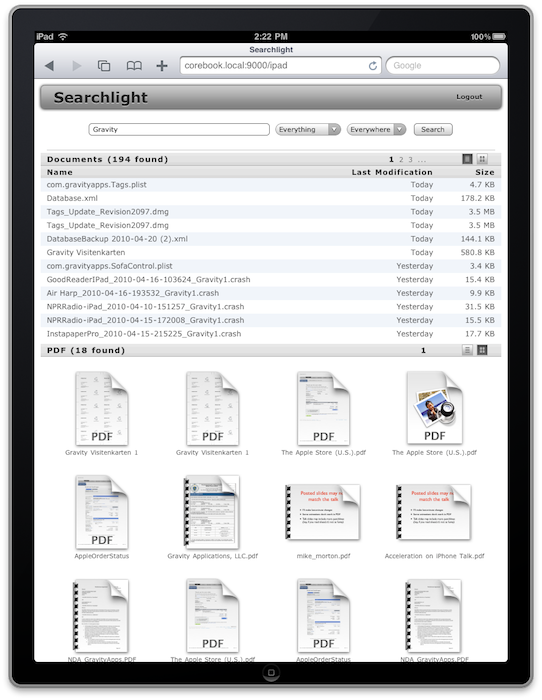 With Searchlight you are able to access all your PDFs, Emails and Office Documents right from your iPad. Access videos you downloaded on your Mac but are not synced on the iPad yet. We even extended Searchlight to work in combination with our tagging solution Tags. Assign tags to your documents, emails and Web Links and access them on the iPad. That’s especially useful if you did tag Web Links for further research or just to read on the iPad. You can also tag your emails and later scan through them on your iPad. Searchlight is as a Web Application. You must not buy an App in the App-Store to give it a try. A web application can’t provide quite the same full featured interface a native application can. However, web applications must not go through or fear Apples review process. Developers can use whatever tools and languages they like. In fact the server part of Searchlight is a combination of Objective-C and Ruby/Rails. 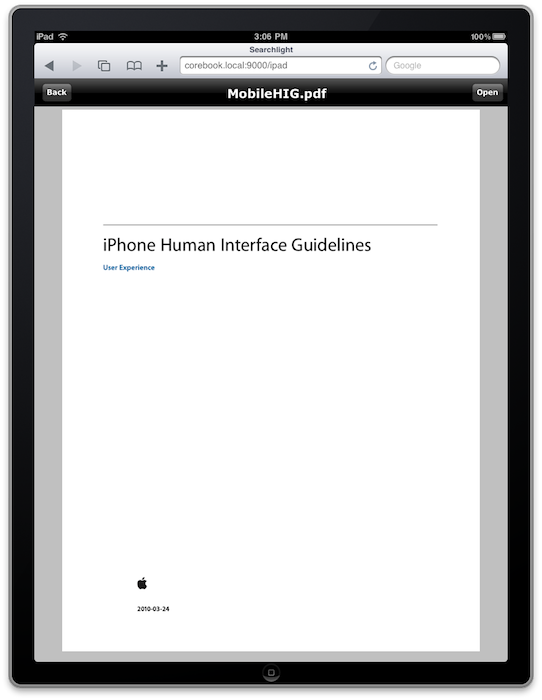 With all that discussion about Apple and section 3.3.1 of the SDK agreement, people should not forget that the iPad is also an awesome device for surfing the web. You probably can’t do everything with HTML5 but a web app certainly feels more home on the iPad than on the iPhone.